The NFC Dynamic Tag is a wireless module with a cable interface to enable data transmission between NFC reader/writers (Android smartphone, NFC port, PaSoRi, etc.) and other electronic equipment or gadgets. A cable interface uses our own triple-wire half-duplex communications and can be controlled even with a low- speed host CPU. 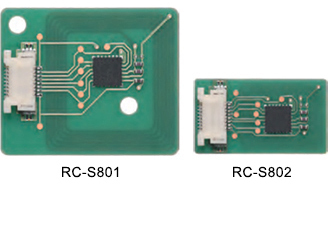 For development of applications on the reader/writer side, it is possible to use existing products, such as SDK for NFC, which are able to access the wireless interface of the NFC Dynamic Tag. * For any application development, the customer is required to follow the specifications. * We are not planning to offer an interface library. The current consumption during operation is less than 1 mA and during standby is kept at 0.1 μA or less to provide power supply conditions suitable for a battery-operated device. The NFC Dynamic Tag includes a function by which the magnetic field generated by the reader/writer can be detected and the host CPU informed. The NFC Dynamic Tag can emulate an NFC Forum Type 3 Tag if the data from the host CPU in response to any commands sent by the reader/writer follows the specifications of the NFC Forum. The emulated device can communicate with any reader/writer, conforming to the specifications of the NFC Forum. * This product does not have a nonvolatile memory. If the power is cut, the internal data is lost. Unlike a FeliCa card there is no function to constantly store data. * The 212 kbps is the modulation speed of the RF interface. * The effective speed of data transmission is dependent on the processing capacity of the controller of the cable interface and the wireless interface system. * After integrating into any (customer) device or gadget, please confirm the communication characteristics of the device with which the NFC Dynamic Tag should respond.